There are innumerable things for all of us to give thanks for. Most of mine are personal, but there’s one very important business-related one: I am very, very thankful for all of you who believed in the return of TableMaster even when I was kind of unsure about it myself. Thanks to all of you, I am once again doing what I really love after all of these years. And for that, I am very, very thankful. Of course, I can’t just write Thanksgiving wishes; there has to be a table. So before I sat down to my Thanksgiving table, I wrote one. This will run with the TableMaster demo version as well as the full one. It’s here: the Thanksgiving Table. I’m back to something resembling functional. Even almost back to coding. I wrote a few tables yesterday, because the custom promo dice were out for delivery, and I’ve had a crazy idea for a product. 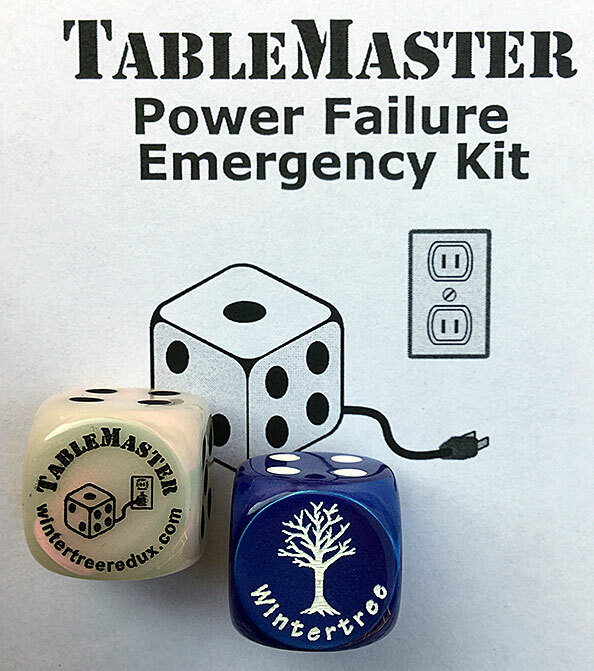 Author Wintertree SoftwarePosted on November 15, 2016 Categories Musings1 Comment on Power Failure Emergency Kit! I can’t work. I can barely function. Sorry about that, but I am a human being, as much as I try to present my company-self as neutral in all things and separate from anything but writing software. I am a human being, and an American, and the events of this week have affected me badly. You really do not want what I might do to the code this week. I don’t want to debug what I might do to the code this week, and it would waste all of next week, too, fixing it. I’m not going to use this blog for a political rant — this is about TableMaster, not about what TableMaster’s author thinks about politics, or about art or music or anything else for that matter. I can keep up the public impartiality that far. But right now, I can’t write code — especially cross-platform code. If I worked for someone else, I’d be using my personal days right now. As it is, I’m going to take this week off from Wintertree and quit trying to force myself to get any productive work done, because I’ve been trying and it’s just not happening. Everything will be back on track next week, just a bit behind schedule. Everyone, be kind to one another. Even people you disagree with. Especially people you disagree with. We have seen what divisiveness and hatred can do; let us not embrace it ourselves and thereby prove it is right. Today in 1922, Howard Carter opened the only (mostly) intact tomb in Egypt’s Valley of Kings, the burial place of the now-famous Tutankhamun. What he found awed him. It has been having a similar effect on other people ever since. I have something of an obsession with ancient Egypt. Between printed and video material, I could fill a decent-sized bookshelf; I can hardly wait for the “Path of Osiris” dungeon tiles I backed on Kickstarter to arrive; and those of you who remember the old Arcane Alphabets fonts will remember that they included what I believe is the only hieroglyphic font that allowed short characters to be stacked properly. Yeah, definitely an obsession. So when I started revising the Table Packs, I looked at the original tombs table, which produced little mini-dungeons, and realized that could be converted to an Egyptian-specific one rather easily. That would be quick, no? Well … no. By the time I got done with it, the Egyptian Tombs table described everything from who was buried there to the decorations on the walls. It’s become one of my favorite tables.